How much funding will the Greater Boston Immigrant Defense Fund be awarding? More than $1.1 million has been pledged by Greater Boston Immigrant Defense Fund partners. The Greater Boston Immigrant Defense Fund will continue to engage with new partners to increase funding. The funding for the 2-year pilot program was provided through the generous support of local foundations and corporate partners. The City of Boston will be providing in-kind support for the Fund through the Mayor’s Office for Immigrant Advancement. Partners for the Greater Boston Immigrant Defense Fund include the organizations listed to the right. Our first round of funding is now complete. Please stay tuned for updates on future rounds of funding. The Massachusetts Legal Assistance Corporation (“MLAC”), the largest funding source for civil legal aid programs in Massachusetts, will serve as the initiative’s fiscal sponsor. As the fiscal sponsor, MLAC will coordinate a process to review proposals of and then distribute the grants to nonprofit agencies and legal services providers seeking grants from the Fund, in line with the priorities and eligibility requirements outlined in the RFP. Massachusetts Law Reform Institute (MLRI), a statewide poverty law and policy center and Immigration Coalition convenor, will serve as the coordinator for the network of Immigrant Defense Fund grantees. What is the role of the City of Boston in the Fund? The Fund will operate for a two-year pilot period. • Located in communities along and/or east of the 495 corridor (i.e. 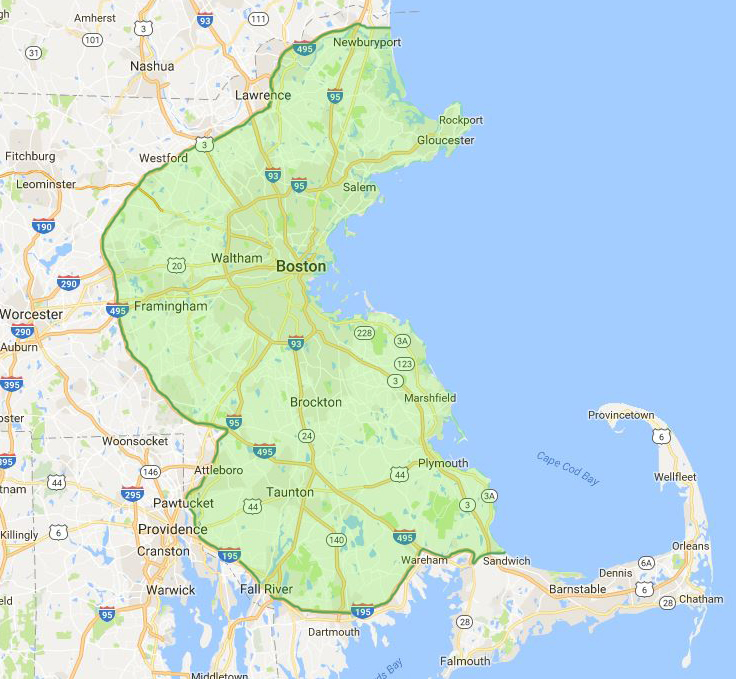 inclusive of Lawrence, Lowell) as well as 195 (i.e. inclusive of Fall River, New Bedford). • Demonstrated knowledge of the Greater Boston immigrant community, including populations that are most vulnerable to immigration enforcement action. • Proven track-record and capacity to provide services to immigrants in the Greater Boston area. This RFP will support only organizations in communities that fall along and/or east of the 495 corridor (i.e. inclusive of Lawrence, Lowell) as well as 195 (i.e. inclusive of Fall River, New Bedford)–the area shaded green in the map at right. We are not currently accepting applications for funding. The application materials provided below are for reference only. Organizations can apply for one or both of the categories of funded activities. The two categories are: (1) Enhancing legal service capacity; (2) Strengthening community education, outreach, organizing & referrals. I am an attorney in private practice. Can I apply for funding? No, only nonprofit agencies and nonprofit legal services providers are eligible to apply for funding. However, if you are an attorney who is interested in offering pro bono services to immigration court defendants, contact Janne Hellgren at jhellgren@mlac.org to learn how you can get involved. What information do I need to include about my organization’s board and staff in the application? Please use the chart below as a guide.